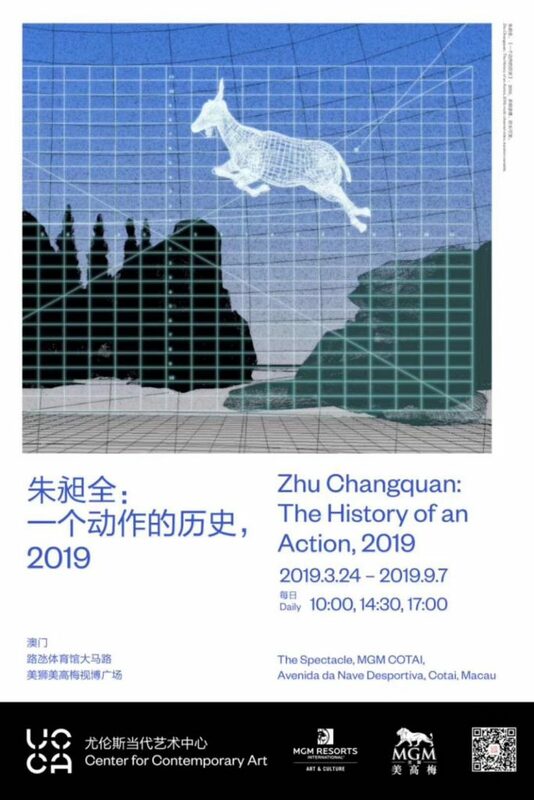 UCCA Center for Contemporary Art is pleased to announce its collaboration with MGM Resorts Art & Culture to present “The History of an Action, 2019” by the Chinese artist Zhu Changquan (b. 1989 Shandong province, lives and works in Hangzhou and Shanghai.) A massive multi-channel video, Zhu’s 18-minute work disassembles events, symbols, and visual expressions into various discrete actions, interrogating their underlying logic. 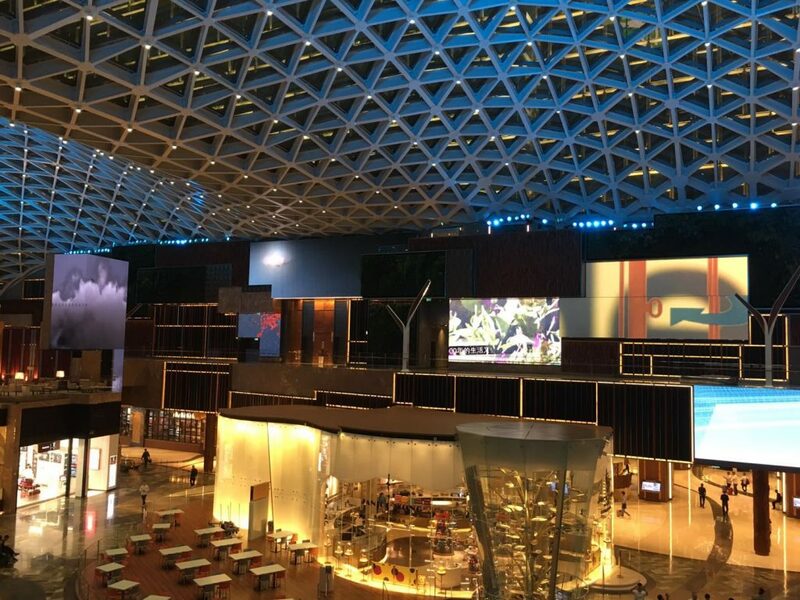 It is presented on The Spectacle at MGM COTAI—an innovative, multi-dimensional sensory experience comprised of 25 various sized LED screens, making up the world’s largest array of permanent indoor LED screens. This uniquely immersive environment explores the possibilities of public art as a shared digital experience. The exhibition is curated by UCCA curator Yang Zi. The work will be shown three times daily, at 10:00, 14:30, and 17:00, through September 7, 2019. In Zhu Changquan’s work, virtual and reproductive technologies combine to formquasi-scientific “optical substitutes”; in an artificially controlled virtual space, the artist brings restraint, silence, patience, and rigor to bear on his “test subjects,” waiting to discover their hidden principles. This experiment comprises five sections: “Jump from the Past,” “Head Without Brain,” “Boundary Post,” “Aisle” and “Dead Island.” The first three explore the ontological structure of a virtual space designed by the artist, and the manner in which it extends into the real world. 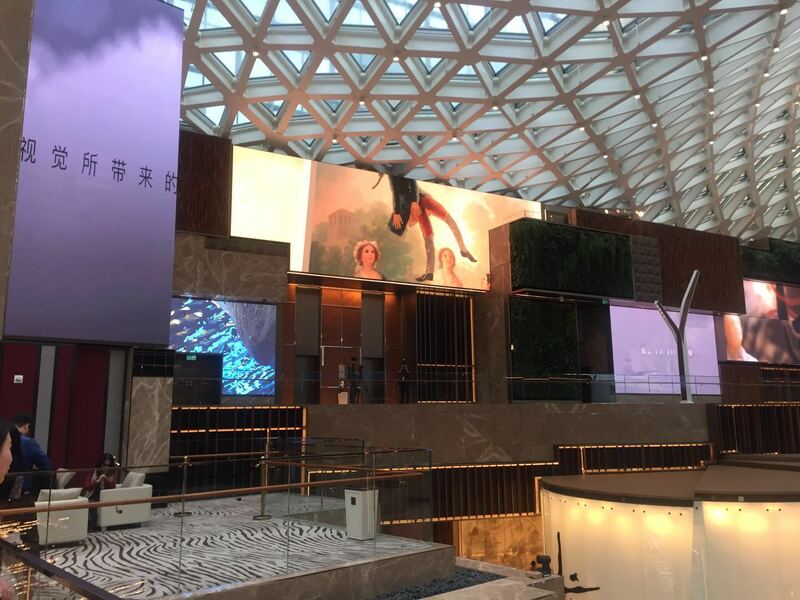 “Jump from the Past” proceeds from certain historically significant dates, to scenes of flies, mosquitoes, moths and fish, as well as the ubiquitous sights of Hangzhou’s suburbs in autumn. The juxtaposition of these images and numbers seems to call into question all attempts at easy historical periodization. In “Head Without Brain,” the artist produces photographs of the Hangzhou suburbs in which he used to live, compressing reality in a set of images that, while flat, nevertheless flow, circulate, and fold. The two artworks mentioned above are paired with voice-overs and subtitles that abruptly shift in register and logic; a realist rubric, however, anchors them. In addition, a user interface frequently appears within the artwork—the round, cut up images in “Jump from the Past,” or the background of “Head Without Brain,” remind us that human vision is merely a kind of “video” in its own right, controlled and edited by a higher-dimensional being. This Platonic vision is further explored in “Boundary Post,” which offers a model of direct perceptual intuition, proving fragments that are delineated by image, principle, and space-time, corresponding to Zhu’s investigations of physics, mathematics, and Chinese philosophy. Within this model, the artist has created two specific scenes. “The Aisle” is divided into three parts: the reproduction of a trip (“Aisle A”), as well as two interpretations of the myriad codes that appear in the course of this trip (“Aisle B” and “Aisle C”). “Aisle A” is an animation, executed in a casual, “first-person” style that resembles realism. Zhu’s “protagonist,” who never reveals his or her face, starts the film by observing statue of Jesus, then slowly backs into a living room with plants, a rug, and furniture (a toppled chair lies on the ground), before ascending steps to the second floor, entering a recreation room, where a game table, a jukebox, and a dartboard flicker in the faint light. Afterwards, walking through a long corridor, the “protagonist” enters a bedroom, glancing at the fruits arrayed on a table, a bed covered with a plump, motionless woman, and the cartoon that is playing on the television screen, where a raging pink sea god roils the seas. The final stop of the video is the bathroom; inside the bathtub, a yellow condom floats. This tour of the vast mansion is suffused with dread, reminding viewers of a classic horror film, filmed in a claustrophobic hotel. However, “Aisle B” and “Aisle C” aim to foreground the artifice behind such an atmosphere: “Aisle B” depicts a puppet, motionlessly narrating the story of its life as music and background alternate, whereas “Aisle C” only presents the silhouette of two legs walking. “Dead Island” is based on the similarly titled “Isle of the Dead” by 19th century Swiss painter Arnold Bocklin. A tourist, dressed in white, stands on a boat that sails towards white, craggy mountains, shaped vaguely like a woman’s pelvis. Dotting the mountain, lush pine trees seem to solemnly greet the tourist. Zhu Yongquan’s filmhas also been divided into parts A, B, and C, “Dead Island A” serving as the main work, while “Dead Island B” and “Dead Island C” retell “Dead Island A” from different perspectives. The story starts from the rippling user interface of a mapmaking program. The camera starts underwater, pointing towards the surface, where a sheep’s head can be seen. It breaks the surface of the water, accompanied by whistling and whale song, and tracks a group of mountain goats that jump from the rocks into the ocean. The goats swim towards the mysterious island in Bocklin’s painting, unexpectedly encountering the condom from “Aisle A.” The moving images in the artwork frequently turn into incomplete mathematical models, defamiliarizing the audience, distancing it from the scene’s immersion and romance. This “flickering” increases in frequency, and more models from “Aisle A” appear in “Dead Island A.” Looking back, now, at the many paintings that decorate the mansion in “Aisle A,” the viewer realizes that they now contain images from “Dead Island A”—these two parallel worlds thus obtrude into one another. In the present era, only after we perceive the mediated information that constantly washes over us, do we begin to concern ourselves with the reality behind it. “The History of an Action” attempts to awaken this paradoxical experience in viewers, thereby showing them how surrogates and substitutes have permeated day-to-day life. In Zhu Changquan’s expansive artwork, technical mediums are like shadows of the material world, creating a dyad of real and virtual, which the artist adapts to other binary relations between the physical and nonmaterial worlds. His experiment reminds us: these dyads—whose causal relationships might have in the past seemed commonsensical—today reverse, yielding strange results. Zhu Changquan (b. 1989, Shandong, lives and works in Hangzhou and Shanghai) has held solo exhibitions such as “History of an Action” (OCAT Shanghai Pavilion, 2018) and “Head Without Brain” (Vanguard Gallery, Shanghai, 2016). He has also participated in numerous group exhibitions, including “The New Normal: China, Art, and 2017” (UCCA Beijing, 2017); “Plane Tremor” (Long March Space, Beijing, 2016); and “The Liver” (CAFA Art Museum, Beijing, 2016); Oberhausen International Short Film Festival (Germany, 2015); and “Memorandum to the Earth” (Power Station of Art, 2014).